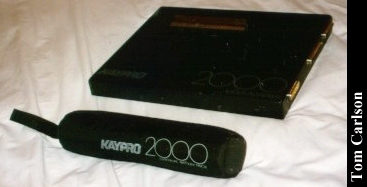 Kaypro produced several CP/M based computers. 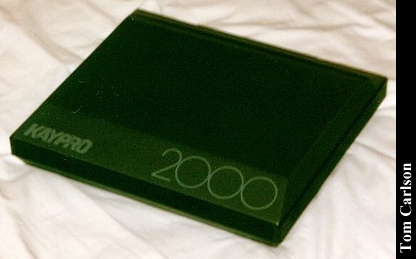 Eventually they produced a DOS machine, the Kaypro 2000. 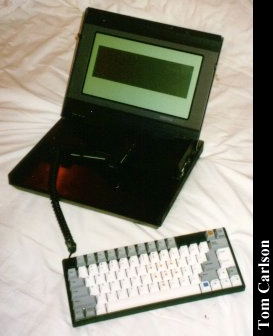 While everyone should lament the passing of CP/M, this is still one crankin' laptop. First of all, it looks damn cool. If Darth Vader carried a laptop, it would look something like the Kaypro 2000. You can't really see it in the pictures, but the case has bevels that go in a good inch. It's shaped more like a wedgy sports car than a blocky laptop. It's all black metal, except for the edge, which is covered in ridged black rubber. This all makes it strong, heavy, and solidly built. Installed inside the case is a battery pack the size of 4 C-cell batteries. This also contributes to its considerable heft. Really, the first time you pick one up, you have a hard time believing that something so small could weigh this much. There's a nice handle built into the edge as well. Inside you'll find an 80x25 character screen. It's not the sharpest LCD screen, but it's still better than most. The screen itself is much smaller than the available area. At the front of the case is the keyboard. The keyboard is removable and is connected to the rest of the unit by a coiled cord. The keyboard has little feet on the back edge, so you can prop it up. You can even put it back in the case with it propped up. So, put it in your lap, put in on the table, or put it back in the laptop. Any way, you'll always have that keyboard in reach. It's also a very nice keyboard in and of itself. Behind the keyboard, on the right side, is a floppy drive. The front pops up out of the case to let you insert disks. The software side is pure DOS, with an added utility to see things like battery juice remaining. It also had a suite of programs that were RAM resident. It still amazes me how much we used to be able to pack into 640K. Microsoft's Office 97 took up 120 megs on my system, and that wasn't even a full install! 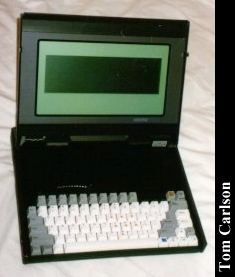 Top view, showing the keyboard in the case. Close-up of the carrying handle. 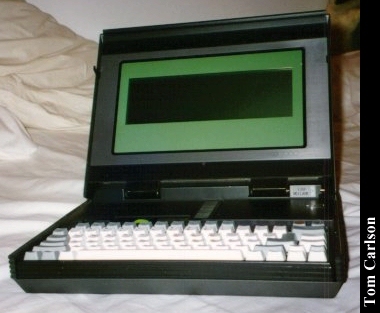 Front view of the Kaypro 2000. Front view with the keyboard removed and the floppy drive popped up. View of the expansion base and extra battery pack. There's another battery pack built into the case. Click here to view all comments for the Non-Linear Systems Kaypro 2000 and to leave your own.